If you want to eat a pizza but are scared of the calories presented by it to you, then you must try our tried and tested Fruit Pizza Recipe. This healthy pizza recipe is ideal for kids who skip their lunch meals in school. 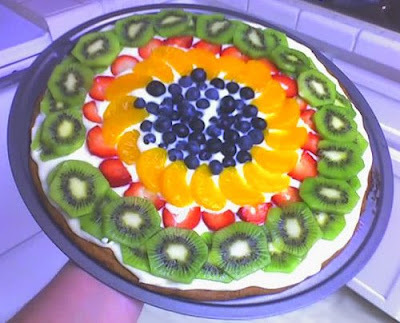 Be it an occasion like Christmas or New Year, you can make Fruit Pizza and delight your guests. · First of all, preheat the oven to 350 degrees F.
· Take a large bowl and cream together butter and 3/ 4 cup sugar to make it smooth. Then, mix in the egg. · Now, combine the flour, baking soda, salt and cream of tartar. Keep stirring until well blended. Press this dough in an ungreased pizza pan. · Bake it in preheated oven for about 10 minutes or until lightly browned and then cool. · Take another large bowl and beat cream cheese with 1/ 2 cup of sugar and add vanilla extract until light. Then, spread it on cooled pizza crust. · Top the pizza with your desired fruits and chill before serving. This would be a perfect dessert for a party I'm having. Could any of this be made a day before? The party is after work and I won't have any time to cook/bake the day of. Thanks!